Some lower back pain can be successfully treated with a lumbar sympathetic nerve block. Administered by an experienced Manhattan sports injury and back pain doctor, this treatment comprises a series of injections to block the pain from reaching your brain. Similarly, a stellate gang block, or stellate ganglion block, accomplishes the same thing, but in your upper body instead of in your lower back. Make an appointment today with the best rated back pain relief specialist Dr. Melepura of sports injury clinic of NYC. An effective treatment to ease pain in your lower back, a lumbar sympathetic nerve block delivers pain relief exactly where it’s needed. A sympathetic block is a series of injections aimed at stopping your sympathetic nerves from carrying pain massages from your lumbar or lower back up to your brain. It’s considered a pain management technique. Your sympathetic nerves don’t always carry pain massages, and they don’t hurt just because another set of nerves are hurting. Your lumbar sympathetic nerves run along your spine in your lower back. Most of the time, their purpose is to control your body’s unconscious functions, like your breathing and blood flow. A lumbar sympathetic nerve block delivers anti-inflammatory pain medicine directly to your sympathetic nerves, where you’re feeling the pain. In most cases, the pain from your sympathetic nerves travels from your lower back down one leg. Since sciatica presents similar symptoms, it takes a knowledgeable and experienced pain physician in New York City to diagnose the real cause of your pain. The pain you experience can affect your day-to-day life and your activity levels. The discomfort isn’t limited to an activity like running or standing either; it’s a constant ache that can force you to seek over-the-counter pain relievers. The pain may limit your mobility as well. If rest and nonprescription medications don’t ease your pain, schedule a visit to the Sports and Pain Institute of NY. Sympathetic nerves run along both sides of your spine. If you feel pain in your face and upper body, a stellate gang block may help. Like a lumbar sympathetic nerve block, a stellate gang block eases pain, but instead of pain in your lower back and leg, this pain is in your head, chest or arms. This procedure may also be used as a diagnostic tool to test whether your stellate ganglion is the cause of your pain and discomfort. First, you’re made comfortable on an x-ray table, lying face down. The x-ray machine delivers continuous fluoroscopic images that help your doctor place the injections exactly where they’re needed. You may receive intravenous medicine to relax you, but this isn’t general anesthesia. You remain conscious during the procedure. Your NYC physician applies a topical anesthetic to numb your skin so you won’t feel the initial prick of the needle. The fluoroscopic images guide your doctor to the sympathetic nerves where your pain originates. A contrast dye is injected first, to make the area easier to see on the fluoroscope. Once the exact spot along your spine is identified, your doctor injects the medicine — a combination of saline, local anesthetic and steroidal anti-inflammatory drugs — all around the area. After withdrawing the needle, a small bandage is placed over the injection site. Your back pain should ease right away, as the local anesthetic gets to work. It’s possible that your back or legs may feel numb for a few hours. Your legs may even feel weak during this time. These temporary side effects are from the anesthetic, which stops working after a few hours. In the case of a stellate gang block, you shouldn’t feel any numbness in your face, but you may have a droopy eye temporarily. This and any other side effects disappear as the local anesthetic wears off. Your pain may return at this time because the steroid medication hasn’t yet begun to work its magic. The steroids reduce the inflammation, which in turn eases your pain. But it may take as long as two days after the injection for you to feel these effects. In the meantime, your doctor may prescribe prescription-strength pain relievers for the short duration. 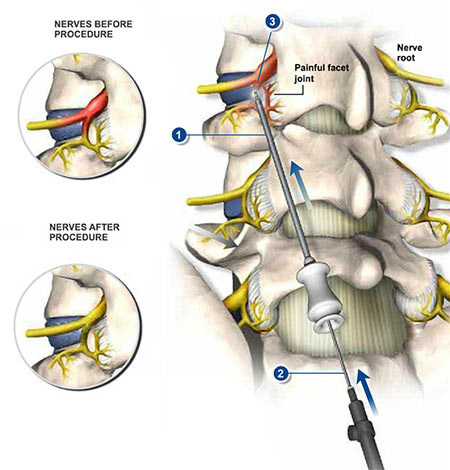 A lumbar sympathetic nerve block and a stellate gang block both stop the symptoms of pain. They don’t heal your problem by themselves. But by allowing you to relax without pain, your body can better heal itself. If successful, the effects of the injections last for several months. Do you have any questions about the sympathetic nerve block to relieve your back pain we offer in NYC? 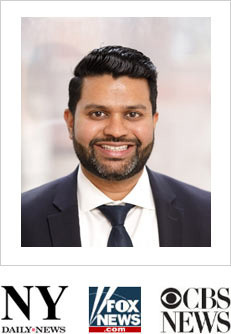 Would you like to schedule an appointment with the best rated back and spine doctor Febin Melepura MD of New York sports pain management clinic? Please contact our office for consultation with the top pain relief specialist in Midtown Manhattan.